The 2016 Supra SE 550 ROUSH Edition is no ordinary boat. It takes everything our customers love about their Supra and Supercharges it. With the style and power of a Roush Stage 3 Mustang and bold design of the Supra SE, the 2016 Roush Edition perfectly intertwines the automotive heritage of Roush Performance and precision engineering of Supra Boats. The 2016 SUPRA ROUSH Limited Edition is based off the flagship SUPRA SE. The same proven platform that pulls the 2015 WWA Wakeboarding World Championships and 2015 SUPRA Boats Pro Wake Tour. It retains all the standard high performance features you’ve come to expect from a Supra SE, and includes other premium options found throughout the Supra line. The heartbeat of the 2016 Supra SE 550 Roush Edition comes from an engine package with all the power and performance you expect from a name like Roush. The 6.2 L ROUSHcharged Raptor by Indmar, based off a proven workhorse, the Built Ford Tough® 6.2L 16-Valve V8 engine that was designed, engineered, built and torture-tested by Ford. The same state-of-the-art engine that powers the F-150 SVT Raptor and F-Series Super Duty Trucks and boasts best-in-class gas horsepower, torque and max towing ratings. Pair this proven engine up with ROUSH Supercharging technology and it delivers a massive 575 LB-FT of Torque and over 500 Horsepower. The Supra Competition hull was a benchmark design of Supra that took the performance of our boats to the next level. This innovation is alive and well across every boat in the 2016 line, resulting in massive wakes, stable point and shoot handling, and a superior ride in rough water. Supra Swell Surf 2.0 is precision engineered to provide the cleanest waves with maximum height and push. 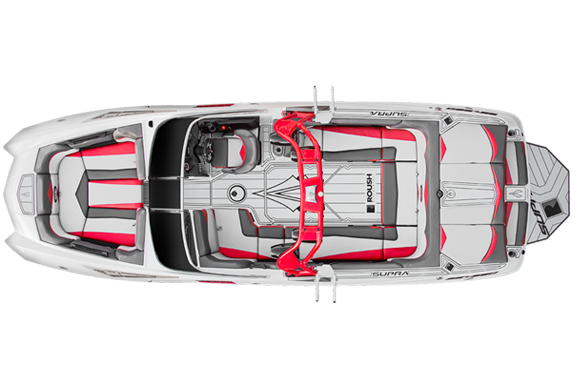 It’s the same proven system that propels riders on the 2015 Supra Pro Wake Surf Tour and of course, its standard on the 2016 Supra SE 550 Roush Edition. The Supra Launch System combines the power of the Supra Smart Plate and revised Swell Surf System to make planing under load even easier than ever. As speed increases both systems deploy in tandem, reducing drag in the water and increasing acceleration to get the boat quickly and smoothly on plane. Billet PTM Board Racks provide form and function on the Roush SE 550. Constructed of durable billet aluminum, these premium racks clamp your boards securely in place and swivel internally or externally to protect your precious cargo. Supra’s Liquid Lead Ballast System is standard in every Supra boat. Easily managed through the Vision Touch System, load your Supra with up to 3200 LBs of wake shaping ballast to take your wakes and waves to the next level. The Supra Vision Touch System puts you in control of the ride with just a tap of the touch screen. Easily navigate through ballast and surf settings, GPS, stereo controls and more in full color, making the ROUSH Edition as fun to drive as it is to ride behind. The Supra SE 550 ROUSH Edition includes the latest technology and our integrated column and wheel controls are an industry first. With integrated color contrasted controls to keep Stereo, Swell Surf, Camera, Wake Plate and Cruise adjustments at your fingertips without even taking your hand off the wheel. The Innovative Vision Transom Camera puts safety first, providing automatic feed to the integrated Vision Touch screen when in reverse, and full view of the rider behind you with the touch of a button when towing. Every high performance feature in your Supra deserves to be protected. And that’s what the Supra Protection Plan provides. 4 Levels of coverage to protect every component in your new Supra boat. Engine, Hull, Interior or trailer, we’ve got you covered. Precision Engineering isn’t just about innovation, it’s also about reliability and customer satisfaction. Supra just received it’s 10th Straight NMMA CSI award, proving that our commitment to quality is alive and well in every Supra boat. 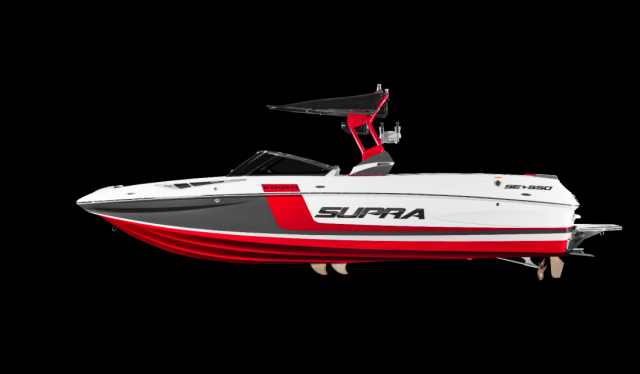 The Supra SE 550 ROUSH Edition takes the style of a Roush Mustang straight to the water. With the trademark Roush Hockey Stick designed right into the gel coat and race-inspired elements strategically designed into the trailer, tower, interior, and engine compartment. This bold design creates a look inspired by automotive performance but conveys the same aggression and attitude on the lake as it does on the street. A boldy designed staple of every Supra boat, the Pro-Edge Tower gets even more beautiful on the Roush SE 550. With Custom Colored Red Pearl Metallic paint to match the Iconic ROUSH hockey stick on the hull and two-tone tower shield to seamlessy accent the gelcoat. Billet aluminum is a material of choice throughout Supra boats. Tough, strong and resistant, aluminum makes a statement. So we anodized it black to claim its dominance in the ROUSH Limited Edition, its the perfect complement to the level of performance and function you get with SUPRA and ROUSH. To complete the package of the SE 550 ROUSH Edition we didn’t stop with the boat. Every element of bold design translates to the custom Boatmate trailer that tows it. Red metalflake complements the Roush hockey stick while painted calipers and drilled stainless rotors peek through custom 18″ Billet wheels with ROUSH center caps. The interior of the SE 550 ROUSH Edition is undoubtedly inspired by the heritage of ROUSH. With machined aluminum emblem accents on the seats, ROUSH branded bezel around the vision touch dash, and CNC autographed Jack Roush USA glove box door. ROUSH inspired design of the durable Sea-Dek non-skid flooring complements the custom emblems throughout the interior, while a Supra designed non-skid caps of the look and function of the Supra swim platform. Nothing in this boat conveys the idea of combining racing performance and watersports prowess more than the shifter in the ROUSH Edition. The black anodized billet Livorsi shifter is capped off beautifully with a genuine ROUSH performance shifter ball. Just like the one standard in every ROUSH performance vehicle. No premium towboat or performance street car would be legitimate without sound to accompany its power. So JL Audio stepped up to provide premium components for the ROUSH Edition. Four 8.8″ JL Towers speakers tuck neatly under the Custom Pro-Edge tower while the 10″ JL Audio Sub and amps hidden under the helm and dash provide bas and power to the 6.5″ JL Speakers throughout the deck. Paired with custom Red LED accent lighting and Red and White JL badging and this system provides as much style as it does sound. Each ROUSH Edition interior comes complete with 1 of 2 Race-inspired color themes. Both feature color-matched vinyl to match the tower, hull and graphics and both are completely refined with color-matched contrast french stitching throughout. The SE 550 ROUSH Edition is so refined we had to show it off. The interior is accented with strategically placed red LED lighting inside the speaker boxes and along the deck while red underwater LED lighting accent the transom.